The County Council are holding a three month public consultation on improvements to the A414 corridor, including a Hertford bypass. Very interested in the survey as my recollection is that LTP4 spoke of 87,000 homes being needed by 2031 and now we have leapt to 50,000 along A414 plus 80,000? Unfunded There is currently no funding agreed for this scheme. 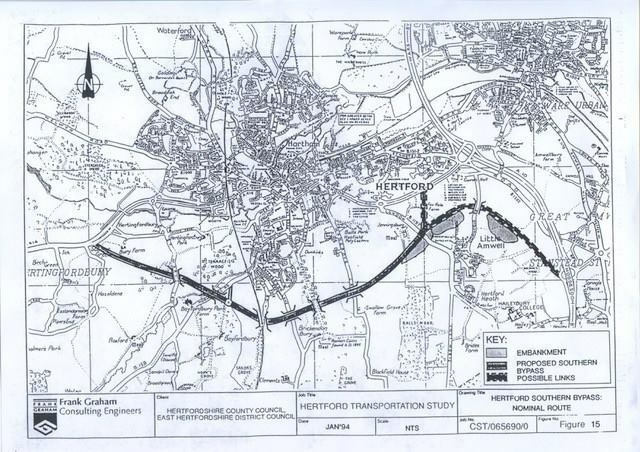 Here's the route as proposed in 1994. Yes it's been going on that long. See if you can work out how many expensive houses lie on the route. Among others it looks like it goes right through the Foxholes and Dawlicious farms. Thanks for that - it is interesting and quite easy to read. Must say that (whilst not read in detail) the first fact that hit me was that Herts population density at mid-2017 (per hectare) was 7.19 against East of England 3.23 and England 4.27. Not sure building more roads and reducing the green spaces (which will also be being lost to housing) is going to solve anything but just create gridlock, more stress and loss of quality of life. Is there any sign of where to post comments about the draft document? Has the consultation actually started? I'm thinking that affected Town and Parish Councils ought to be providing official responses. But where? The consultation has yet to be formally announced or opened. It was approved by the council on the 14th November. I'm not sure how long it takes to be the materials and structure to be organised but I imagine something will be available soon. And there it is. It apparently runs till 8 June 2019.
runs until 25th feb 2019.